10 secret tips how to survive a long flight in economy like a pro! Economy flights can be horrible. Cramped seats, unedible food, a crying baby behind you, a half-broken entertainment system or a neighbor stealing all the armrest space sounds familiar? Then this article is written for you. I’m going to share 10 essential tips from 30 years of traveling on how to survive a long haul flight like a pro. Instead of waiting for that mystical upgrade to business class that is never going to happen, you can employ these tips and tricks to turn 12 hours in hell into something bearable. Make sure to pack it all in a plastic bag for airport security (I am using a more stable one like this). A good option for the toiletries is asking for the free samples at your local drug store – I usually do it when I buy new stuff and never heard a complaint. The middle aisle bathrooms are usually a bit bigger, so pick these when you plan to brush your teeth and freshen up after you woke up. Aircraft cabins are heavily pressurized and air-conditioned. As a result, your body (especially your skin) will dry out way faster than normal. Staying hydrated (see amenity kit above) is very important. Instead of waiting for eternity till you can order your tomato juice from the service wagon, stock up one big bottle of water after airport security. Your body will thank you. Dehydration can cause headaches and an already stressful flight can turn into a nightmare. If you don’t want to buy water at a premium, here is a tip: Take a canteen through security and fill it up with tap water (as long as the hygienic standards in your departure country allow it). An empty water bottle does the job as well. Note: If you walk down the aisle to the end of the aircraft into the “kitchen”, stewardesses will usually provide you with a cup of water or two if you ask them nicely. No need to be shy. Note: It also helps you enjoy the entertainment system better. Ever had the problem of turning up the volume to the max and still not understanding it all? With proper headphones, the LOWEST setting will easily be enough. Be prepared to be amazed! What is the best spot to sit on a plane? Well, not an easy question because almost all spots are a compromise. The middle of the aircraft will be best in case of turbulence but offers the worst view. I usually try to pick a seat in the very back. It might be the loudest and bumpiest part of the plane (incidentally also the safest), but as the reservation systems usually fill up the aircraft from the front, you have the highest chance of scoring one of the coveted empty rows. 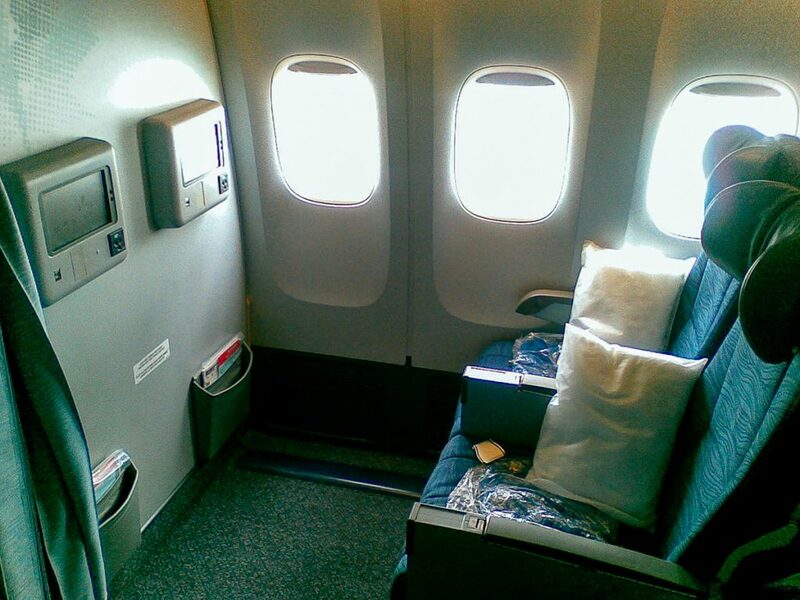 Also, as a lot of people will want a window seat, picking the middle row can be a good option as well. Especially if you pick two outer seats and leave the middle empty (if they do fill up you can always ask to swap places). On long-haul flights, the view (usually) doesn’t matter. What matters is if you can sleep well, and picking a seat where you can, should be your top priority. You can also reserve seats at the emergency exists or those at the very front, as they have extra legroom – but reserving these is not always easy and usually costs a bit more. Food onboard planes is, with very few exceptions, quite disgusting – even in business class (though it often looks prettier). But hey, it’s not exactly an easy job to serve 300 pre-prepared & cost efficient dishes at the same time at an altitude of 30.000 feet. 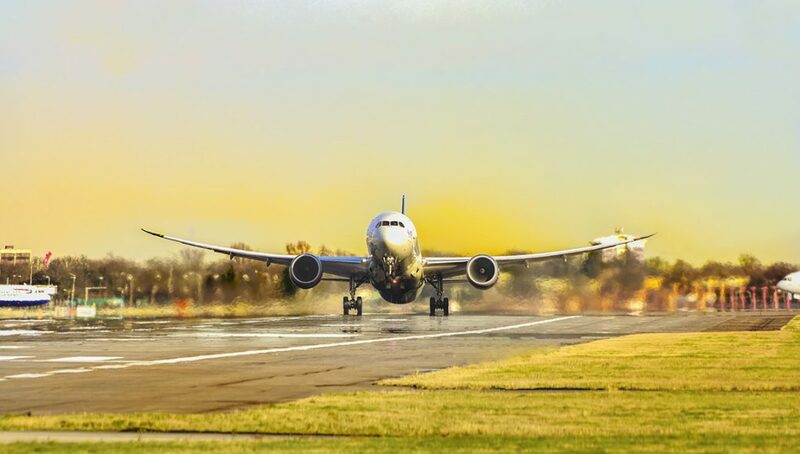 The good news: In most countries, there are no bans on exporting food or bringing it past airport security (importing is a different thing, so better check in advance!). You can easily stock up some non-liquid (important :P) food at a supermarket or even in the duty-free area (usually quite expensive) and bring it aboard. That way you can pick your favorite treats instead of enjoying the mystery meat of the day with overcooked mush once said to have been vegetables. Note: You can also order special food, but that is usually very expensive and you’re better off bringing your own stuff. We already talked about how important a sound sleep on a long flight is. Truth be told, sleep on a plane is very rarely truly relaxing or regenerating. But with a few tricks (noise canceling headphones & picking the right seat) you can help it along. A good neck pillow (not this inflatable rubbish please) and an eye mask will help you a great deal with achieving bliss. Pick one made from silk, as it doesn’t dehydrate your eyes. Wearing your shoes for 12 hours, especially while sleeping, is maybe not the best idea. But neither is entering the toilets barefooted or in socks only. Also, due to the heavy air conditioning, there is quite a draft. If you are a sensitive person like me, heaving some slippers & maybe socks to prevent thrombosis is a very good idea. Note: I usually pick up some slippers at the hotel and add it to my amenity kit. They might not be made to last, but they are light weighted and easily stored in your hand luggage. I already mentioned trombone. The older you get, the bigger the issue gets. It is very important to stretch ever so often, maybe walk around the aisle a bit, say hi to the stewardess and ask for some water – whatever – but just don’t sit 10 hours straight in your seat and not leaving it once. It’s unhealthy. Don’t feel awkward strolling through the aisles. Your legs will thank you. Also, changing your seating position ever so often is recommended. Most long-haul carriers offer an entertainment system – usually with quite a good selection of movies. However, the screens are usually quite tiny. If you got a tablet pc, you might consider downloading a movie or two for the flight and enjoying the superior image and sound quality instead. That way you also avoid interruptions during the endless announcements. An offline game or two might be a good idea as well – especially when traveling with kids. Note: Remember to bring a USB cable. Most airlines got a socket to charge your devices during flight. Last, but certainly not least, it’s very important to book a good flight. 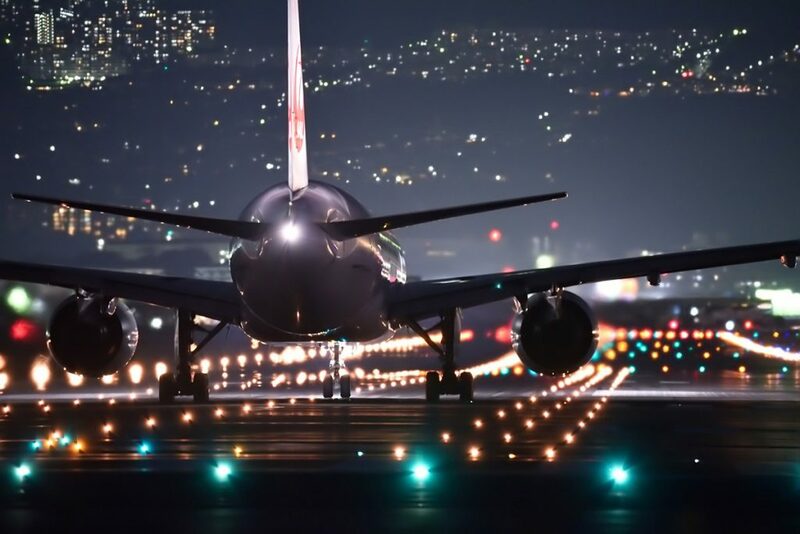 If you take an early morning flight, sleeping onboard will be so much harder than on a night flight (which ultimately results in less of a jet lag). Same applies to direct flights versus a layover. 6 hours in Doha (even though the airport is quite great), will add extra stress to your itinerary no matter what. For super long flights (say London to Sydney), it can be a smart idea to extend the layover to one or two days and, to stick with the example, explore Qatar a bit before you move on. Note: Please keep in mind that maximizing your time at your destination should also be a priority. 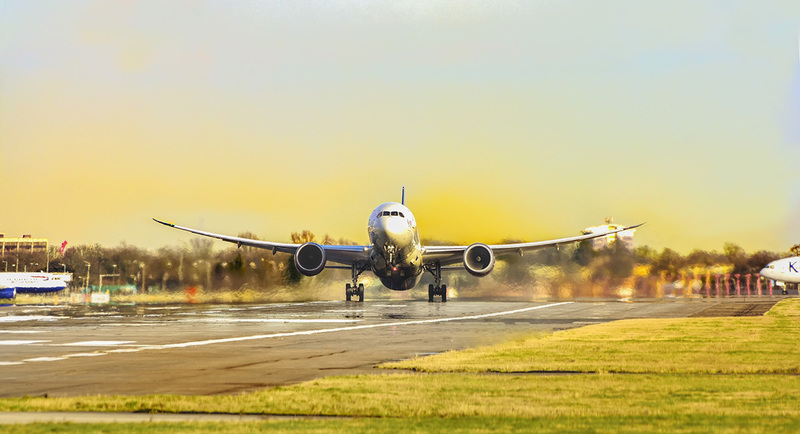 Booking flights that arrive late at night or depart early in the morning could mean you need an extra night at your hotel – not so frugal. Now, I already mentioned quite a lot and I want to keep this list as concise as possible. I didn’t really talk about what to wear long flights, because obviously, you should pick something comfortable. In the old days bringing a shawl was advisable but these days you get blankets on most airlines. I also didn’t really talk about sleeping habits. You should time it just right, so you’ll already accustom to the time zone you are traveling to (which might mean sleeping longer or shorter). All things considered, using your common sense is probably all it takes to handle the basics. 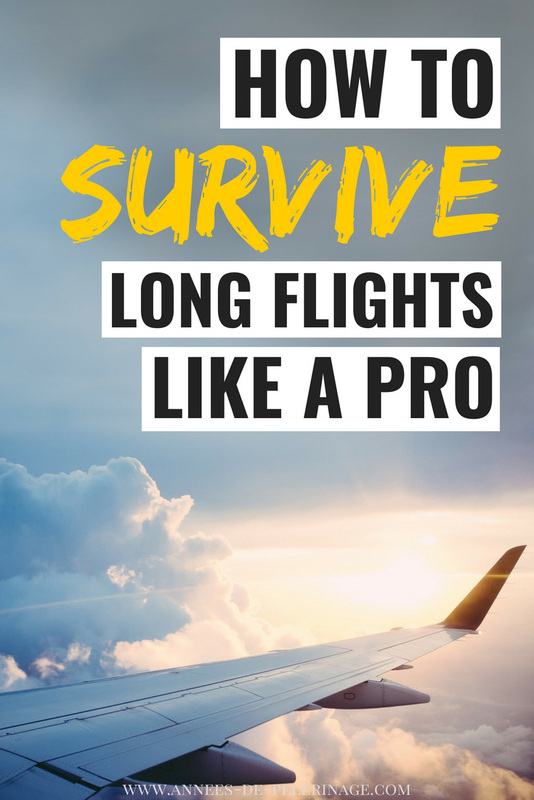 So, this was my article on how to survive a long flight like a pro. Got any questions? Feel free to ask them below. And don’t forget to pin this to your Pinterest board. Great article with good tips. I’ll never be able to call thrombosis by its proper name ever again.